Learn the traditional skills of drawing and painting in a European style atelier art school. The Summer School Intensive is full-time atelier training, painting and drawing from plaster casts in the morning and a life model in the afternoon. Immerse yourself in the world of classical realism taught by Rob Gutteridge, the Director of the first ARC Approved atelier art school in Australia. A special feature of the Summer School will be long-pose drawing and painting: 40 hours over 2 weeks, 1 pose, 1 model. Summer School will introduce new skills, and hone those you already have. Learn sight-size drawing and limited palette painting of flesh tones. Suitable for beginners to advanced students and practicing artists. In Week 1 you will work on 1 cast drawing in the morning (20 hours on 1 drawing), and 1 life drawing in the afternoon (20 hours on 1 drawing). In Week 2 you have the option to continue working on the same cast drawing and life drawing from Week 1 for a further 20 hours. Or begin painting from the cast in the morning and life model in the afternoon. Summer School provides extended time to resolve each drawing or painting, allowing visual and technical issues to be addressed in depth. It is well rewarded in the high quality of learning and its outcomes. 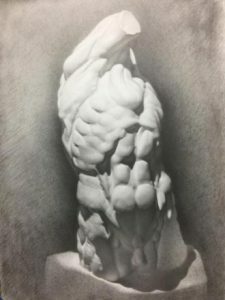 Charcoal lends itself to a “painterly” approach to drawing, well suited to dealing with figure ground relationships, and the figure in a value context. Painting is only taught in Week 2. It is strongly recommended you attend Week 1 if you intend to paint. In Week 2, painting is an option. If you do not want to paint, but instead want to continue developing your drawing skills then you can continue working on the drawings from Week 1. ⦁ Increased knowledge and skills in all areas outlined in the “Tuition” section above. 1. Notify your intention to enroll. 2. RGCR will notify you if there is a place available and email you an invoice. 3. Reserve your place by paying the fee as per the instructions on the invoice. 4. RGCR will confirm your place is reserved and email a materials list. Places are limited to 10 students so be early to reserve your place. ⦁ A refund of 20% of the total fee paid is available if a student withdraws on or before 2/1/19. No further refund is available irrespective of the reason for withdrawal. ⦁ If for any reason the Summer School is cancelled, all money paid by students will be refunded in full. ⦁ Rob Gutteridge School of Classical Realism: 49a, Whitmore Square, Adelaide. South Australia 5000.